Hello again everyone and welcome to my latest newsletter. a neat little countdown timer to the page which I think looks very good! 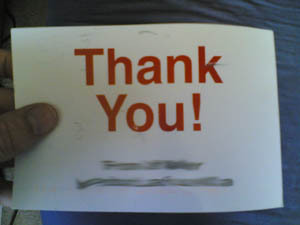 that I`m sure a lot of you also received, it was about the new eBay store fee`s. how these changes will effect your monthly eBay bill. Why have eBay decided upon these changes?? it may be worth trying that method. you have any questions or comments then as always leave me a comment! OK, I don`t want to do a big intro because I know you all want to see the video! Greetings everyone, I hope you all survived the mini-UK heatwave. It looks like we are back to normal today so at least it gives me a chance to write this weeks newsletter for you! This weeks newsletter may turn into a “mini-rant” so please accept my apologies if it does! This week I will be looking at how to deal with snotty eBay members. This all stems from an email I received earlier this week, I have dealt with snotty customers before but this one really got on my wick! I managed to bite my tongue with this eBay buyer and just sent the usual reply explaining what the problem was. They didn`t reply to the email and haven`t paid for the item, but that got me thinking why are people so snotty? I don`t just sell on eBay, I am also a regular buyer. I often have problems with transactions so I email the buyer. NOT ONCE in my 5 years of trading on eBay have I ever sent a snotty email and I never will. Can somebody tell me what sending a snotty email achieves other than getting yourself added to my blocked buyers list? I will be interested to hear how the rest of you handle snotty emails from eBay customers, do you find that a nice polite reply is the best way to go or do you let rip! I always use the polite reply technique but sometimes it`s very tempting to tell them exactly what you really think. Likewise if you are one of those people that sends snotty emails please leave a comment and let us know what sort of results you get? Personally I am much more likely to help a person if they send a nice polite email, if I receive a snotty email I will answer the question but I wouldn`t go out of my way to help the person, what do you think, should we make a stand against the snotty email senders? – feel free to leave a comment! Thanks for reading, sorry it wasn`t as long as usual but I have just been recorded for Bold Business Talk radio so I haven`t had much free time on my hands! Keep an eye out for the next SOS! update. I will be revealing the release date and time, I will also have some huge news for those of you that have asked about the affiliate program! 1. Will it be able to search all worldwide sites at once for a specific item? Auction SOS! can search ANY of the worldwide eBay sites. Within seconds you can find out the most popular items from every eBay site in the world, from Italy to India – the choice is yours! 2. Is it easy for a beginner to use? When we designed Auction SOS! we tried to keep the interface as simple as possible (as you can see from the above screenshot). We didn`t want Auction SOS! to be one of those software titles that you install, run it and then find you need to spend the next 2 months learning how to use it! Auction SOS! is “Pick up and play” software, that means as soon as you install the software even a novice PC user can begin benefiting from all of the features straight away, there is virtually no learning curve. We have tried our best to keep everything as straight forward as possible, we haven`t filled Auction SOS! with complicated features that you will never use – we know that isn`t what you want! 3. Is this just another one of those low budget softwares? Auction SOS! is anything but “Low Budget” software. Anyone that has been following the SOS! updates from the begining knows how long SOS! has been in development for – almost 6 months! Hundreds of hours have gone into the software, including research time, development and testing. We also have some great features planned for the future so watch this space! 4. When I buy it, do I have to pay for future updates? When you purchase Auction SOS! all updates (no matter how big or small!) are available free for 2 years after your purchase. Although we have some great updates in mind we are always open to your suggestions, Auction SOS! is your software, if you want a feature added then you can let us know! I hope that has answered a few more of your questions, sorry if there are a few typo`s thrown in there but I`m roasting in here and I need to get outside!!! If you want to comment on the screenshot or would like me to answer some more questions, as always please leave a comment and I will do my best to respond. How can I generate more sales from my eBay store? really be teaching you anything different would it? This got me thinking, why don`t more eBay sellers do this? sure that you make that customer a customer for life? I think it is. make sure that you turn that customer into one of your customers for life! newsletters feel free to leave them. I read them all and enjoy your feedback. published some of your testamonials.